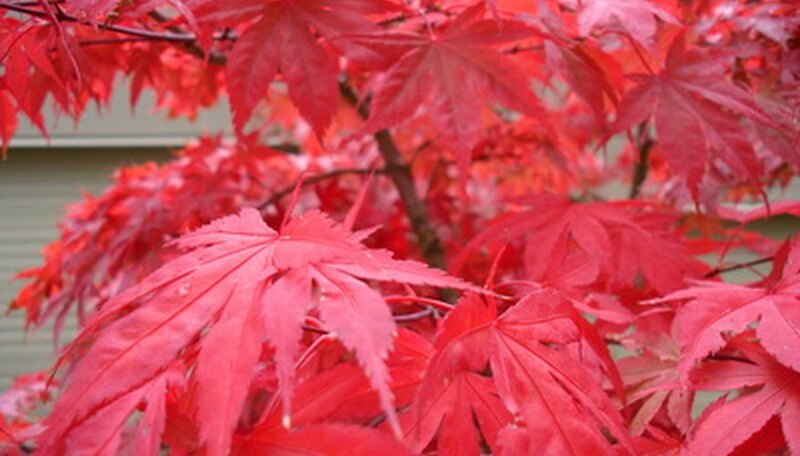 Japanese maples are most commonly planted as ornamental specimen trees to showcase their richly colored foliage and delicate, irregular and slightly weeping canopies. Young trees benefit from heavy pruning to develop a strong lateral branch architecture, according to the University of Florida. Very little to no pruning is required for mature trees, and any pruning that is undertaken should be thoughtful and follow the natural contours of the canopy as much as possible. Prune young trees to support future growth in the winter when the tree is dormant. Remove weak or spindly branches, completely vertical shoots, downward-growing branches and interior-facing branches that cross or abrade one another. Preserve outward- and upward-facing branches. Place all cuts down to the parent branch, just outside of the slightly swollen branch collar. Prune the canopy of mature trees only when they are interfering with utility lines, structures or other trees. Plan to prune in the winter when dormant or during the late spring when the tree is not under other stress. Remove only as many shoots and branches necessary to correct the conflict and keep the canopy looking naturally balanced. Prune away weather-damaged, diseased, dead or otherwise troubled branches and foliage any time throughout the year when you see it. Pull the cuttings clear from the canopy and compost or discard. Place the cut back to the point of healthy wood or to the parent branch just outside of the swollen branch collar.